When you step foot into the office on your first day at a new job, what do you expect to see? Row upon row of white desks and computers, sterile fluorescent skylights and the odd potted plant? If so, then you can imagine how pleasantly surprised new workers are when they walk into these incredible office spaces for the first time. In a time where Ikea-style timelessness seems to be the standard in office design, a select few distinguishing businesses are taking a new tact in giving their workspaces a more real, lived-in feel. These companies are recognising the merits of rooting their office design in a time and place. In short: vintage office designs are having a moment, and the personality and creativity that these retro designs evoke is changing the way we envisage the workspace. We all know the clothing retailer, Urban Outfitters, as the effortlessly cool brand that fuses bohemian whimsy with grungy ‘90s callbacks, preppy basics and a generally alternative attitude. Their headquarters offices in Philadelphia, Pennsylvania, encapsulates this beautifully. 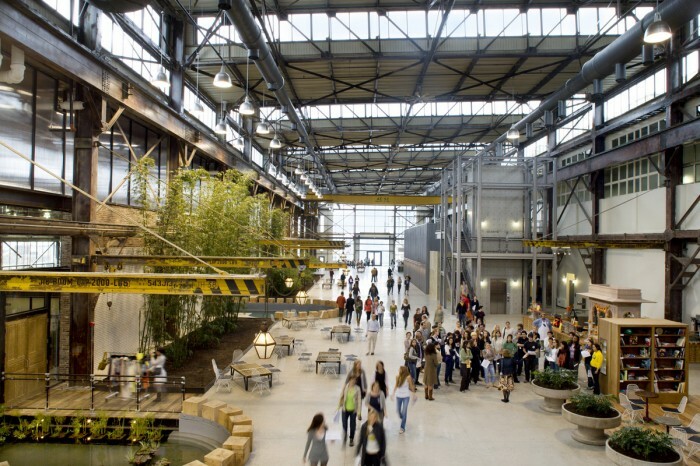 The HQ is built from a renovated navy shipyard, that had been standing in decay for hundreds of years. However, rather than modernising the space, Urban Outfitters preserved the rough paint, aged timbers and steel beams. Wood was made into stairways, steel was sandblasted, allowed to rust and sealed in colour. The result is this beautifully eclectic, open-plan space where everything from art deco furniture to old sewing machines tables coexists in a creative interplay. Comvert is a company housed in – you guessed it – a renovated and repurposed old building, This time, however, the offices have been remodelled from an old abandoned cinema into the offices of this alternative clothing brand. This theatre-esque space allowed the brand to hold their offices, warehouses and a shop all under one roof. Inside, exposed steel and wood is everywhere, with hairpin leg seating and, of course, plenty of vintage skateboards on display. What’s really special about the Comvert offices, though, is the break-out area. The room above where audiences used to sit in the once-cinema has been transformed into an indoor skate bowl, suspended above the warehouse. This fantastic addition shows how even a vintage space can be given a modern twist with the right vision. Feisty and full of verve, design studio Parliament’s headquarters are perhaps the most laid back on this list. As per their company values, they prioritise the comfort and happiness of their employees with breakout spaces suited for everything from collaborative working, to play and relaxation. Their Portland, Oregon roots are also proudly on display through all the recycled materials they’ve gathered to liven up the space. Old street signs, a salvaged pizza oven and a bearskin rug are among some of the quirkier pieces that give the environment a truly vintage vibe, as well as wood reclaimed from an old barn and a church. While this approach to design might seem a little haphazard, the attention to detail and finish applied to each element is excellent, allowing everything to work together in a cohesive manner. The result is a space that breaths creativity, freshness and spirit that is already intrinsic to this studio’s business model. So those were a few of our favourite vintage-inspired office interiors. If you want to inject class and timefulness into your company workspace, our office design services are the perfect choice. To find out more, contact us today on 0208 226 2161.